A frontal system got stuck over the hills of West Virginia the night of June 23, 2016 and caused historic flooding over the central and southern counties of the state. Twenty three people were killed, including a 2 year old who's lifeless body was found by search and rescue workers on the Greenbriar golf course. 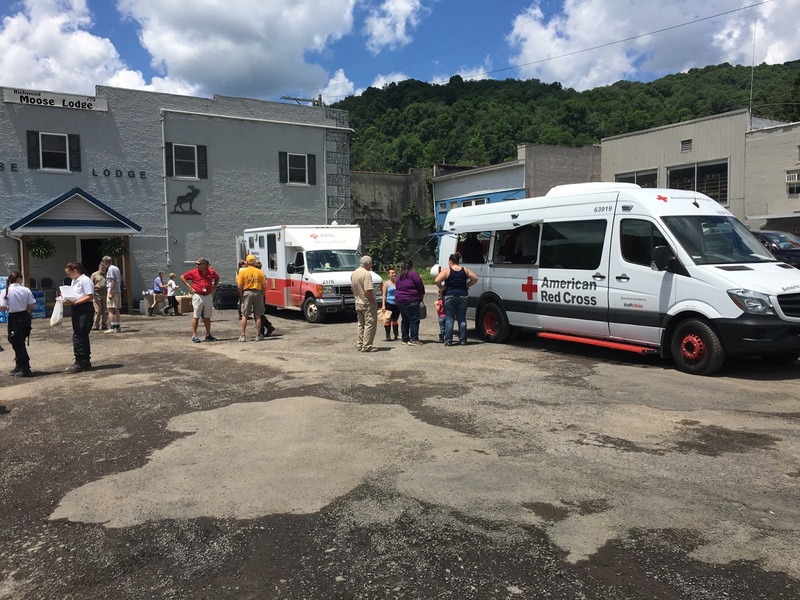 On June 24 the American Red Cross, in response to the flooding, deployed me from my home in northern Virginia to Charleston, West Virginia. I worked on the response for 2 weeks. I spent almost half of that period in the little town of Richwood. I want to tell you a little about what happened to me there and, more importantly, what I took away. 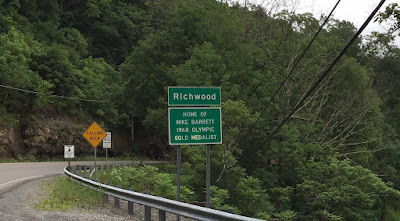 The sign at the limits of the city of Richwood. Dr. Bob Henry Baber was sworn in as the Mayor of Richwood five days after the storm. According to the business card he gave me, Bob Henry (as he likes to be called) is a "Poet, Novelist, Environmentalist, Speaker, Creative Writing Teacher and Mosaic Arts Instructor." He also told me that Richwood was a town of 2,000 souls in which 99% of the children were on free or reduced school lunch. The flooding happened on a Thursday night and into Friday morning. I arrived in West Virginia that Friday night. When I reported to the Disaster Relief Operation (DRO) on Saturday morning the number of staff assigned to the operation had more than quadrupled from the day before. By Monday morning the staffing number had tripled again, and by Wednesday had doubled again. Ultimately, over 700 staff and volunteers were working on the operation. All of the volunteers came knowing that they would be sacrificing their 4th of July weekend. Of the 1500 or so homes judged destroyed by the flooding, the most were in Kanawha County (598), followed by Greenbriar County (460). Nicholas County, in which Richwood resides, had the third highest total, 141. 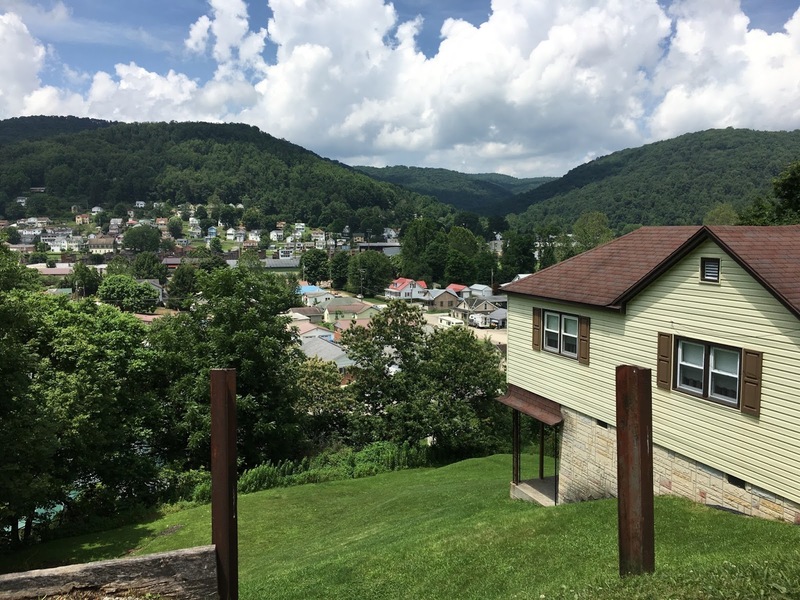 Through the misfortune of geography Richwood was more inaccessible than the affected towns in the other counties.The homes in Richwood were just as flooded. There just weren't as many of them, and the town wasn't as easy to get to. On June 29th the DRO divided the response into 4 Districts and I was assigned as the Mass Care Lead for District 3. 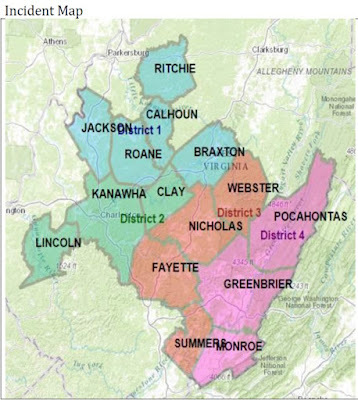 That day I drove from the DRO headquarters in Charleston to the District headquarters in Beckley, just south of the Fayette County line. The division of the affected counties in West Virginia into Districts by the Red Cross Disaster Relief Operation. The morning of Thursday, June 30th I rode north on US 19, a four lane divided highway that I came to know very well in the next week. 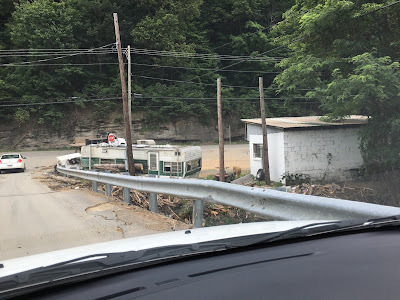 Just south of Summersville we turned East on WV-39, a twisting, turning, harrowing, 8% downgrade that led to the Cherry River valley and the town of Richwood. Viewed from a mountainside the Cherry River Valley and the town of Richwood are pretty. The damage is hidden. At first glance flood damage is not as dramatic as that created by hurricane or tornado winds. With a few exceptions, like the mobile home in the picture below, the damage is hidden inside the structures. By looking at the high water marks and the topography of the valley I could tell that much of the city had been affected. A mobile home washed against a bridge over the Cherry River in Richwood, WV. After the flood waters receded the people of Richwood were inundated with a second flood: donations and volunteers. Different people and organizations stepped up to the task of receiving, sorting and distributing the thousands of items brought in on trucks, trailers and automobiles. The Moose Lodge, across from City Hall, and the 1st Baptist Church on Walnut St. were two such locations that I visited. The largest repository was the High School Gymnasium, a red building down by the river. 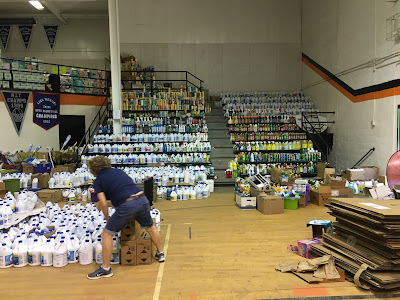 Donated goods at the high school gymnasium in Richwood, WV. The Moose Lodge, untouched by the flooding, was a central location for feeding and donated goods and we initially established a fixed site for feeding there. Access to food was an issue in Richwood since they had no grocery store and the only restaurant I could find was a Dairy Queen, a few blocks from the Moose Lodge where I stopped when I wanted coffee. Food pantries, supported by food banks, have the traditional role of feeding the hungry in blue-sky days. The food pantry in Richwood was by the river and was innundated by the flood. I worked with the food pantry and the food bank people to start the road to re-establishing this service. The Baptist kitchens and the Red Cross ERVs couldn't be there forever. In order to transition to long-term feeding we had to get the food pantry back in operation. I was able to start this transition process before I left. Red Cross Emergency Response Vehicles feeding at the Moose Lodge in Richwood, WV. A Type 1 Field Kitchen from the North Carolina Baptist Convention was assigned to support District 3 and operated at the Restoration Fellowship Baptist Church in Mt. Nebo, just off US 19 south of Summersville. I ate a lot of meals from that kitchen. The meals prepared by the kitchen were delivered into the 4 counties of the District by Red Cross ERV's. The meals are kept hot by insulated food containers called Cambros. You can see the Red Cambros stacked on pallets in the picture below. Positioning loads for Red Cross ERVs at Kitchen #3, operated by the North Carolina Baptists, in Mt. Nebo, WV. We were fortunate to have a Team of Americorps Volunteers assigned to support us in Richwood. Many of the inhabitants of the city were elderly and didn't have vehicles. The Americorps Volunteers delivered meals from the ERVs to them. With the aid of a Red Cross truck and a supervisor, the Americorps Volunteers also loaded donated supplies from the gymnasium and delivered them into the community. Mayor Baber was undaunted by the challenges his community faced and even thought that the disaster could be an impetus for change. The last time that I saw him, just before I left West Virginia, I told the Mayor about Pearlington, MS. I told him how Pearlington had been devastated by the passing of the eye of Hurricane Katrina over the town in 2005. I told him how the many people who came to Pearlington to help had left with a tiny piece of the city in their hearts. Home in Pearlington, MS destroyed by Hurricane Katrina's wind, rain and surge. Someone set up a website dedicated to the recovery of Pearlington and the people who had responded. On the first annual anniversary of the storm the city inhabitants had a celebration with a Low Country Boil of shrimp, crab, potatoes and corn-on-the-cob. Through the website they invited all the responders and I came. I told the Mayor that Richwood should do the same thing. Have a celebration a year later and invite everyone who had helped. When I spoke those words I'm not sure that Bob Henry, a far-sighted a man as I think he was, was able to see that far into the future. He did give me his email and maybe next year, when the months have healed some of the damage of that night, I might remind him. I'm not the only one who left West Virginia with a piece of Richwood in my heart.